After many considerations and developments, I will only be associated with HOB as the retailer of their fine products. 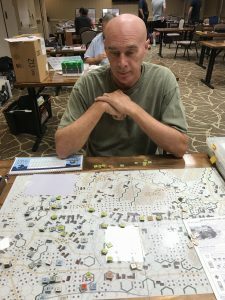 Ritterkrieg will not be reprinting any of the modules or countersheets. We will continue to honor the 20% off coupon code ‘HOB20’ until the end of the month. This is a great time to get your hands on the classics like Kreta (Fallschirmjager air assault on Crete), SS pack, and Berlin Red Vengeance. Special Ops #8 has nine articles, two ASL scenarios, two ASLSK scenarios, and the game Avenge Pearl Harbor. Featured articles cover Operation Mercury (GTS), It Never Snows (SCS), card play in Avenge Pearl Harbor, Russian setup in Red Barricades (ASL), Dean Essig’s design intent behind the various Gamers series of games, Fallschirmjaeger (SCS), tips for playing the Battalion Combat Series (BCS), and designer’s notes for last issue’s game Autumn For Barbarossa (SCS). 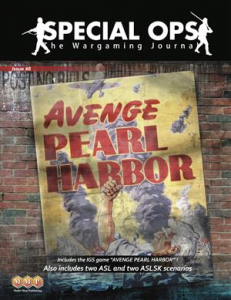 Avenge Pearl Harbor was originally published in Game Journal #60 as Storm Over the Japanese Homeland and allows players to simulate Operation DOWNFALL, the hypothetical invasion of Japan in November 1945. The game uses the same basic system as What Price Glory? Operational cards are used on both attack and defense. Game components include one 22″ x 34″ map, 200 counters, and 32 cards. By the time I was ready to post that the towers were complete, all but one was pre-sold. I have 4 more almost done so hang tight. We are expecting HIF to arrive by the last week of August. Until then I am still taking orders at the reduced price of $55.00 shipping included (in the USA). The winter map is great and gives you a feel for the frigid battles that took place. The oversized hexes making counter density a breeze. The two countersheets were not needed to play the scenarios. If memory serves me, one countersheet was control markers for the CG and the other was miscellaneous extra vehicles and units. The Special rules were simple. There were no new rules to learn, just a short list of old rules that were in or out of play. The scenarios were small to medium and played quickly. The German forces are quite good considering the year (1945), comprising mostly 5-4-8’s, 4-6-7’s, some great leadership and fantastic vehicles like Panthers and flak ht’s. The US forces are a mixed bag of Elite, 1st line, and 2nd line troops. The ROF and MP’s on those Hellcats are nothing to laugh at. Although this product includes a campaign game, it does not look as daunting as some of the bigger CG’s available. I have always preferred the smaller campaign games like this and various Lone Canuck products to the Tarawa sized endeavors (just my personal preference) as I spend less time thinking/purchasing/setting up and more time in the action managing a company instead of a battalion. There is a lot of confusion regarding international shipping rates so until the new website is up and running where we will have an accurate calculator built into the checkout, I will try to explain how the shipping is calculated for international orders. Of course, shipping inside the US is always free. A flat fee of $50 is added to all international orders. This is NOT what you will pay in most cases. If your actual shipping costs are less than $50, you will be refunded the difference. If your actual shipping costs are greater than $60, I will contact you to send a Paypal payment for the balance at which point you can either pay the balance or cancel the order for a full refund. 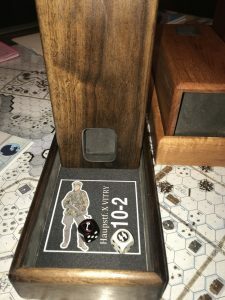 #74 – Le Franc Tireur Kampfgruppe Scherer Player’s Guide. 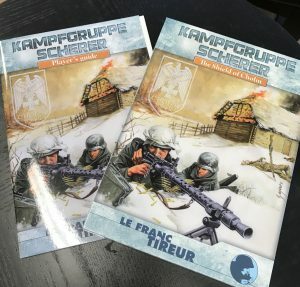 Kampfgruppe Scherer Reprint. after many considerations, Steve and I have agreed to continue our great business relationship as it has been for these past years, only as a retailer of his fine products. 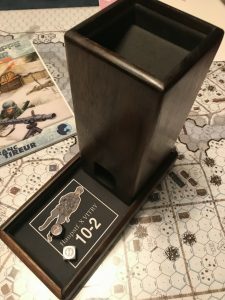 Ritterkrieg will not be reprinting any of the modules or countersheets. 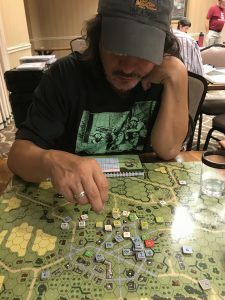 Ritterkrieg is now distributing for Le Franc Tireur in North America. This deal is going to bring you their products quicker, cheaper, and more reliably through our store, the other fine stores that already carry LFT, and new stores that are carrying the line for the first time. If your favorite retail store does not carry LFT, please let them know about the product and pass along my number. We have received the bulk of the existing stock acoss the pond with the brand new KGS Player’s Guide. In the works is LFT 14, concentrating on the Italians. 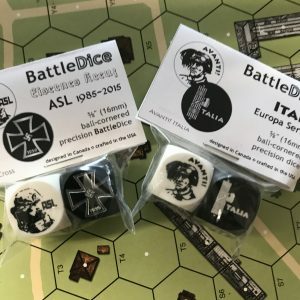 This will include a counter sheet with the entire Italian OOB so you can play the included scenarios along with all the other Italian scenarios. The player’s guide from LFT has arrived and it is a great addition to one of the best campaign games ever made. All is in its title : 60 pages for KGS fans, as well as 9 scenarios and a SASL mission. If you do not own the Kampfgruppe Scherer Module, it can be purchased with the guide for one low price. This is the last of them and we will not be getting any more. Trying desperately to hold off John Dober’s aggressive American attack in the mini semi-finals. John drove all five of his Shermans right in the crosshairs of my hiding Hetzer, only someone forgot to bring the ammo. Rolled boxcars on the first shot. Repaired on turn 3 (yes I was that desperate to risk a recall). The dice towers are done and now I am working on the matching trays. Soon I hope to post a video of the process. I am looking to redo the webpage…Completely. If any of you are web page savvy and have real experience building commercial webpages, please contact me to discuss costs/arrangements. 336-462-4035. It has been a while since I have just chatted with you about where I am and where Ritterkrieg is and where it is going. It has been a long and dynamic past two years. My wife and I split in the spring of 2016. Raising two children, one full time and one half time, along with taking care of the house and two businesses solo for the first time in my life meant that I had to adapt and I had to cut back on certain time consuming activities. This is the reason the Ritterkrieg posts have gone from about one every week to one every couple of months. I also get together with my best friend Tim Brieaddy to play about once every 6 weeks now, where we used to play every week. But like the Soviets after the Battle of Kursk, I can say that the worst is over and I am stronger and more sure of the future than ever before. I met a wonderful woman (that you may know from attending Where the Iron Crosses Grow Team Tournament or if you follow my personal posts on Facebook) and we plan to marry in the Springtime. I have also hired another employee at the shop so I am much less overwhelmed than I have been in recent memory. You may have noticed that packages are once again going out for delivery the same day as they are ordered. The business is growing from the days where I just wanted to sell some OBA cards near cost, to acquiring the distribution rights to the great products of LFT and HOB and even doing some reprinting of modules that deserve table time once again. I want to thank all of you, customers and followers for giving me the support to keep doing this. I always welcome your ideas and love meeting you face to face either at my little tournament or the bigger ones. 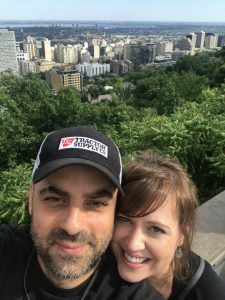 Amy and I at the lookout in Montreal, Canada. June 2018.